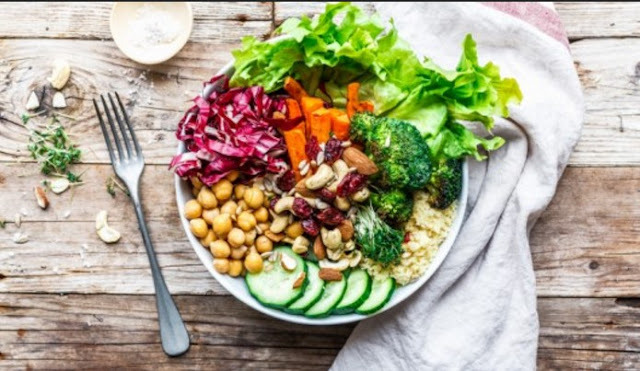 Healthy Vegan Power Bowl With Chickpeas Recipes: Only good things go into this Vegan Power Bowl couscous provides carbohydrates, the vegetables a lot of fiber and the chickpeas provide a portion of vegetable protein. Pour couscous with hot vegetable stock (alternatively only water) and let it swell for approx. 5 to 10 minutes, stirring occasionally. Cut carrots into slices, divide broccoli into small florets. Cut the radicchio into thin strips and cut the cucumber into thin slices. Wash and drain the endive salad. Heat olive oil in a non-stick pan. First carrot strips, then fry the broccoli in it. Now decorate everything in a large bowl. First, add the salad and couscous, then place the remaining ingredients in it. Sprinkle with watercress, walnuts, and cranberries. Finally, add the salad dressing over it and season with salt and pepper.